Checking out a trestle over Oliver Creek in Benton County. Whether the old rail corridor known as the Bailey Branch can ever again serve the cause of transportation, I don’t know. But clearly some segments, especially the one from Alpine Junction to Dawson in the foothills of the Coast Range, have huge potential as a recreational trail. That’s my impression from joining a smattering of other reporters and several Benton County officials on a bus tour Wednesday. 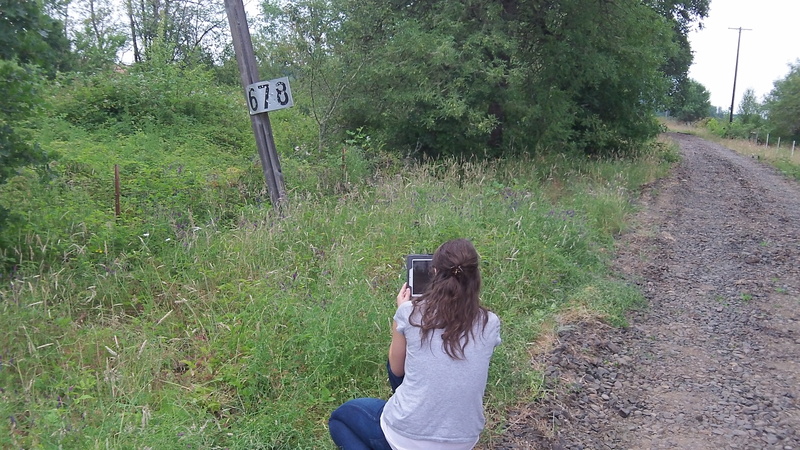 Cody Ross documented features of the rail corridor. Salvaged cross tries are stacked behind her, at Alpine Junction. On the tour, we looked at several points on the 18-mile rail corridor the county purchased in 2013 for $486,000. It’s part of the old Southern Pacific rail network that criss-crossed western Oregon starting in the late 19th century. The Bailey Branch ran south from Corvallis to Eugene when it was completed in 1913. In the 1980s it ended in Monroe. Then, in the 1990s the Willamette and Pacific, later called the Portland & Western, leased the branch from the SP. But in 2007 the P&W stopped service on the line, which was in poor shape and served few shippers other than the Hull and Oakes sawmill at Dawson, the end of the track from Alpine Junction. 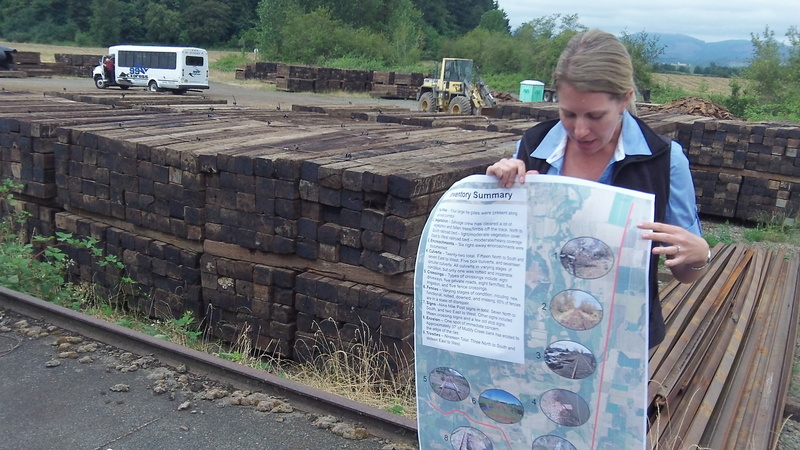 Five miles of the line from Corvallis south were bought by the Vennell farm, which still uses it for shipments. But the 11-plus miles from there to Alpine Junction, and the more than 6 miles from there to Dawson saw no more use. 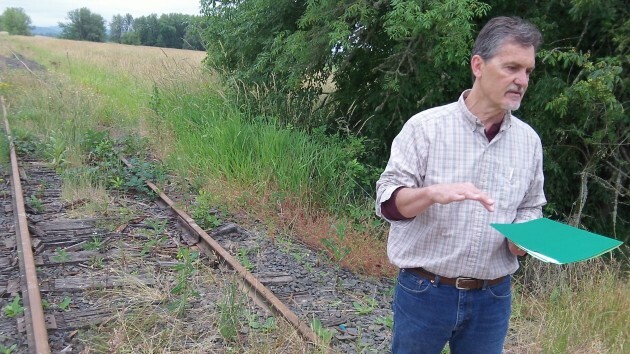 Benton Parks Director Jeff Powers explains that near Greenberry Road, the rail line forms the west boundary of the Finley Wildlife Refuge. County Commissioner Linda Modrell championed the county’s purchase of the corridor — up to 60 feet wide — in order to preserve future generations’ options in transportation. No one can know what people years from now will need or want or can do, she reasons, so preserving this route makes sense. 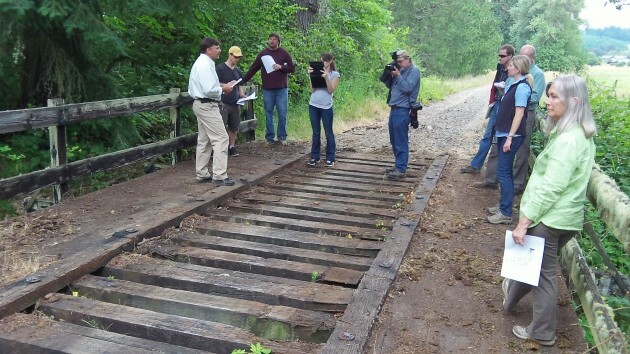 The steel rails themselves and the cross ties were not part of county’s purchase, and a crew has been taking them up. On the Dawson leg they are mostly done, and only the ballast is left of the old road bed. But so are several trestles. We looked at one that spans Oliver Creek. Built of enormous timbers and completely solid, the bridge may be close to a century old and looks like it would last another. Nearby, the creek has been gnawing at the right of way during high water, and the county is looking at ways to stem the erosion there. This is a section, winding through wooded hills and past a stand of pine, that cries out to become a public trail. It’s 678 miles from here to San Francisco. Benton County is working on the draft of a “strategy” to guide deliberations on how to use the corridor while it’s waiting for some future use. Modrell says the county respects the fact that the line runs through private farmland and farmers have concerns about potential risks or problems associated with more public access. Cody Ross, a county engineering survey technician, and a colleague walked the entire corridor taking an inventory of what’s there. Among other things there are railroad mile markers giving the distance from San Francisco, the hub of the old SP. The county workers checked via GPS and found the the markers were accurate. Anyone interested gets a chance to have a say on the draft strategy. Public forums are scheduled on July 8 in Monroe and July 10 in Corvallis, at the county libraries in each case. Hours are the same for each: 3-6:30 to look at maps and 6:30 to 8 for a “facilitated meeting” and public comment on the draft.